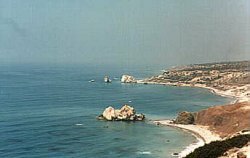 Many ancient sites surround Paphos located on the Western coast of Cyprus. It is home to the second International Airport of the island. Paphos has grown in the last few years to become one of the most popular resorts in Cyprus. Waterside restaurants and souvenir shops surrounding the small harbour with its Fort is one of Paphos major attraction. Other attractions are the House of Dionysos, which contains many splendid mosaic scenes of the pass. The Tombs of the Kings are burial chambers built into the rocks. In a picturesque hillside setting with a lighthouse behind it is the Odeon, an ancient Roman theater of the 2nd century AD, it seats 1250 spectators for open-air shows. Coral Bay, the most famous beach resort of Paphos. Aphrodite’s Bath, a rockpool with its waterfall where legend has the goddess of love taking her bath. Akamas, a wild life sanctuary, is one of the few unspoiled wildernesses left on the island. The best way to visit Akamas is by taking one of the jeep safari rides offered in any major city. And last, the famous Rock of Aphrodite, where according to the legend Aphrodite was born from the foam of the sea.